Here, incredible Berlin restaurants, from a seasonal German hidden inside a sprawling cultural center to a flashy opening that channels the 1920s. Plus: cool food markets, the best pretzels and highlights from the city’s club scene. Pastrami sandwiches are suddenly the rage in some Berlin foodie circles and you’ll find that the preserved deli meat has a starring role at the chic café Mogg & Melzer, which, like the Pauly Saal, is located in the newly revived Jewish Girls’ School. The pastrami is made by hand on the premises, then loaded into sandwiches or served as a salad. The arty international crowd at this intimate befits the proprietors: a DJ-turned-chef and a nightlife promoter. Mogg & Melzer is popular for lunch but it’s also a nice place to grab dinner before a Mitte art crawl. Insider tip: When the weather warms up, ask about the rooftop table where you can take your to-go pastrami sandwich and have a rare view over Berlin’s beautiful Neue Synagoge Oranienburger. When the Japanese pop art star Takashi Murakami opened his first gallery outside Japan in Berlin, a friend, the nightlife entrepreneur Taro Fujita, followed him and last spring opened ULA, a Japanese restaurant specializing in sake and meat dishes. Head chef Daisuke Nakashima, who previously cooked for the Japanese ambassador to Germany, knows how to tailor his dishes to the upscale German palate (think foie gras nigiri, and sukiyaki served with wagyu beef), and continues to do it here. In a sensual black dining room with silver bubbles floating from the ceiling, rising star chef Daniel Achilles, who studied under the three-Michelin-starred chefs Juan Amador and Christian Bau, is creating culinary excitement. Achilles divides his culinary creations into two menus: the “quite near,” which uses local ingredients to create modern regional classics like wild mushroom bouillon with rabbit and morels; while the more experimental “far away” might include king crab with pickled broccoli and almond cream. Michael Kempf, the youngest Michelin-starred chef in Berlin, has cooked under some of Germany’s best chefs, including the three-star legend Dieter Mueller. At Facil—which is housed within the glass courtyard of the Mandala Hotel—Kempf has now carved out his own distinctive style of cooking, with slightly Asian-influenced dishes accented with Indian and Arabian spices. Chef Tim Raue is a scrappy, independent culinary spirit who was born and reared in Berlin. At his restaurant, the interiors mix a few shocking shots of color with inspiration from Berlin (check out the rotating art on the wall) and Asia (displays of ceramics and birdcages). Chinese and Thai herbs, spices and techniques inspire Raue’s cooking and his signature dishes, such as the Peking duck and Dongpo suckling pig, are finely tweaked variations on those classics. 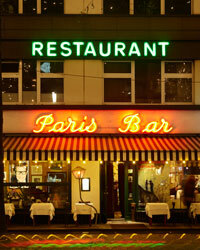 This landmark French bistro, open since 1980, is still so popular it doesn’t have a sign. The feel is familiar: zinc-topped bar, checkered floor and mirrored walls. The menu is full of superclassic dishes like fish soup with garlicky rouille and hanger steak with shallot butter and fries. Owner Mario Brassoit has compiled an extensive 11,000-bottle cellar of affordable wines, heavy on French labels from Burgundy, Côtes du Rhône and the Loire Valley. In early 2009, a young American expat couple, Kevin Avery and Jeffrey Sfire, started the Palisaden Supper Club in their apartment. It was such a success that they started looking for an alternative space to continue on a more professional level. In the summer of 2010 they opened their eclectic bistro and called it Little Otik, after a Czech art house film. Avery, the chef, worked five years at the iconic Diner in Brooklyn, New York, and calls his food oma essen (“grandmother food”). Vegetables are the focus and star in excellent sides such as roasted beetroots with beet greens and horseradish, roasted pumpkin with goat cheese, and honey and cauliflower with tahini. When it comes to meat, much of it is wild and purchased directly from a local hunter. Favorites include duck ragù with polenta, and wild boar with red cabbage, chestnuts and fried Jerusalem artichokes. Berlin’s most successful nightlife impresario, known only by the name Cookie, has made vegetarian cuisine cool with this hidden , marked only by a jumble of lightbulbs dangling from an awning. Chic locals love the delicious and affordable €28 chef’s menus—a collaboration between Stephan Hentsch and Michael Kempf, the Michelin-starred chef from Facil. This clandestine jewel box of a restaurant is hidden behind the bar in a nightclub (Bar Tausend) that is already fairly hidden itself. One of Berlin’s best Asian chefs, Duc Ngo, is in the tiny, open, stainless steel kitchen, sending out Latin-Asian inspired dishes like Peruvian tiradito, tuna tataki wrapped in foie gras, and gourmet pork buns. On par with Ngo’s dishes: the people watching. Make sure to book a table near or after 10 p.m., when the restaurant starts to heat up with a heady mix of Russian models, German art collectors and international socialites. The lunchtime menu at Fischers Fritz is one of Berlin’s best deals. Within the luxury Regent hotel near the charming Gendarmenmarkt, a three-course lunch in this polished, hushed dining room is €47. Despite the conservative vibe of the restaurant, the chef, Christian Lohse, is an edgy, frenetic character obsessed with seafood and pork. This is the perfect place to stop for a tartare of smoked eel and a glass of Champagne, after a morning spent taking in the sites. This quirky little restaurant, on the border of the Wedding and Mitte districts, makes up for its slightly out-of-the-way location with an unusual high-meets-low dinner menu where almost nothing costs more than €10. The mix of influences, from New American to Asian comes from a communal kitchen concept. Three separate chefs share the reins, and they take turns developing the frequently evolving menu. Stephan Hentschel, of Cookies Cream, uses this space to work with meat (Cookies Cream is vegetarian) and his burgers, served with homemade fries and local pickles, are the most popular order. A pub in Germany is called a kneipe, typically a rustic space with a cluster of wooden tables and a bar in the middle. Usually you can’t find more than a few simple dishes and bags of chips at these establishments, but Nansen offers much more. It’s one of the city’s first true German gastropubs, as well as a lively watering hole in Berlin’s fastest developing area, along the canals of Kreuzkölln. The best time to eat here is in the fall and winter when the menu includes wild game, like a fantastic venison leg served with an onion tart and a side of yellow beets. The historic market hall, Markthalle 9, has been renovated to appeal to a more modern food crowd. There are soup stands, a great wine shop, a basement microbrewery and the excellent Kantine 9, a little kitchen run by Gary Hoopengardner, the dreadlock-sporting former sous-chef of the highly respected Altes Zollhaus restaurant. 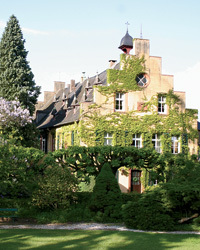 Kantine 9 serves an excellent rustic two-course menu sourced from local farmers for no more than €8. Though customers can expect to wait in line, The Barn maintains a cultish following for its slowly handcrafted coffees. Most of the beans come from London’s Square Mile Coffee Roasters but The Barn also brews “guest” coffees from other high-end international roasters. The cakes are pretty tasty too: All the recipes are from the owner’s mother. Alpenstueck is beloved for its seasonal alpine cooking and minimalist cool alpine interiors (white furniture, deer antler candleholders and a wall of sawed-off oak logs). Even better than the decor is Alpenstueck’s new bakery, especially for lunch or takeaway pretzels. On Fridays the menu includes duck with apple-spiked red cabbage and dumplings. Two decades ago American expat Cynthia Barcomi was the first in Berlin to start roasting her own coffee beans on site. Her two cafés—one in Mitte and the other in Kreuzberg—are going strong. 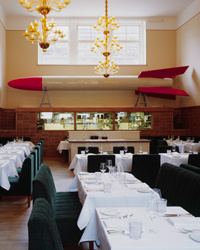 The one in Mitte, hidden in a courtyard between Gipstrasse and Sophienstrasse, is a cozy to hang out for brunch or lunch. It’s still one of the few places that serves handmade bagels and muffins that taste like the real thing. Blink and you’ll walk by this standing-room-only bar owned by local tastemakers Stephan Landwehr and Boris Radczun (of the chic restaurant Grill Royal), and party organizer Conny Opper. Don’t get here before midnight—it doesn’t really get interesting until about 2 or 3 in the morning, when the back room starts shaking with late-night dancing. Berlin’s newest art mile is the gritty Potsdamer Strasse, now HQ for some of the city’s best galleries. Many of them are hidden in historic buildings sandwiched between nondescript storefronts or in industrial courtyards, but the longstanding Victoria Bar is easy to find. The sprawling room is lined with wood paneling and has an old-fashioned West Berlin vibe that many local insiders miss. During gallery openings the bar is packed with a wild mix of artists and collectors. When it opened a few years ago, Bar Tausend was the area’s first grown-up designer lounge. A dark rectangular space designed by the locally based firm RobertNeun, it’s anchored by a long bar and on one side, an enormous 3-D metallic eye emitting a flattering golden light.